As the summer draws to a close and the winter moves in, why not head to Vogue Café for dinner and choose from an array of dishes from the newly launched international menu.Available now, the new menu boasts a range of dishes to suit a variety of palates. The chic eatery, nestled in the heart of Level Shoe District, Dubai Mall, Vogue Café is now offering a new fresh modern menu which has been put together to offer diners a variety of tantalising culinary delights, including appetizers, meat and fish entrées, pasta and risotto dishes as well as a full selection of indulgent desserts. Start your culinary journey with a number of choices from the appetizers list such as soups and salads. To whet the appetite, diners can choose the delicious Miso Soup, served in an authentically designed Chinese Tea Pot with homemade succulent seafood dumplings scented with kaffirr lime.Another signature appetizer from the list is the Late Summer Salad, a mixture of baby leaves, fresh green mango, papaya, watermelon and pomegranate, tossed in strawberry and hazelnut dressing.Or why not try the Tuna Two Ways: Carpaccio and Tartar,infused with Thai basil and honey, served with baby greens. Moving on to mains, diners can choose from fish or meat entrées and some pasta or risotto dishes.The selection incudes Vogue Café Char-Grilled Wagyu Sliders served with Cajun spiced French fries and garden salad or the Earl Grey Smoked Duck Breast, served with braised duck leg spring rolls, Chinese cabbage rolls stuffed with shitake mushrooms, along with bean sprouts and some orange soy sauce to finish it off. From the fresh fish entrée selection, diners can pick from scallop and salmon dishes to the Pan-seared Red Snapper, which is served with creamy chorizo quinoa mixed with cherry tomato, paprika and coriander jam.Or if you prefer an Italian inspired dinner, opt for something from the Pasta and Risotto selection including seafood or wild mushroom risotto. One to definitely try is the Grilled Chicken Penne Pasta with sundried tomato, artichoke heart and wild arugula all drizzled in tangy lemon sauce. Depending on how full you are and for those with a sweet tooth why not indulge in one of Vogue Café's guilty pleasures from tarts and cheesecakes to soufflés and fondants.One to definitely try from the dessert menu is The Chocolate Implosion; with a white chocolate sphere, beautifully presented alongside crunchy mint ice cream served with warm milk chocolate.Firm favourites such as the Strawberry Cheesecake and Vanilla Crème Brûlée still remain on the menu. 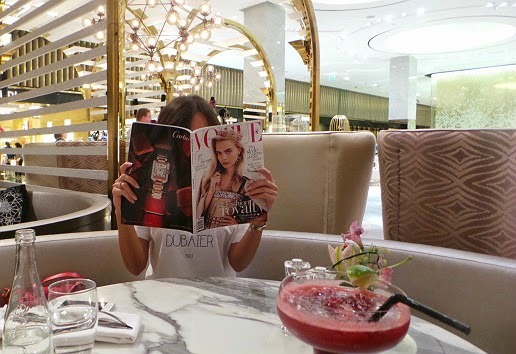 Open for breakfast through to post-dinner snacks, Vogue Café offers a unique dining experience in a space adorned with iconic fashion photography from the pages of Vogue magazine, connecting guests to the brand and it's heritage.